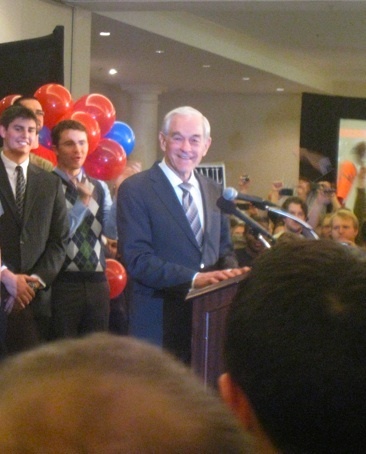 A little over four years ago, I wrote an open letter to my fellow Ron Paul supporters. I will not rehash it again, although you can read it here if you care to do so. Today, I believe it is time to write you again, not to retrace old ground, but to forge ahead into the future. Earlier this week, a fellow Ron Paul supporter criticized my efforts in supporting Dr. Paul’s 2012 movement. Specifically, he made mention of the fact that only two Paul supporters signed up to be delegates to the 6th district convention from my hometown of Harrisonburg. I suppose the thought is that as I am a Paul supporter living in Harrisonburg, I should have done more to get my fellow like-minded activists to the convention in Lexington. Now, I have heard this complaint before. According to one of my friends in the southern part of the 6th district, one Paul supporter has spread this point in the Shenandoah Valley presumably to try and discredit me within the movement. I’m not quite sure why this person would do so, but I did try to find out. However, I never got a reply when I sent the person an email about the matter. Although I know that some of you are new, I would like to remind those who are involved in politics to treat all volunteers as a valuable resource. After all, they are not merely subordinates to be ordered about at our whim. They are our friends, neighbors, and activists in arms who freely give of their time, not in the hopes of financial restitution, but because they believe in the rightness of our cause. Until and unless a volunteer engages in a behavior that is either destructive to the movement or completely counterproductive, (such as threatening another worker or masquerading as an official campaign representative) one should never tear down a volunteer’s efforts. Now, that is not to say that we cannot steer a volunteer toward projects that are more valuable, but to demean a volunteer for not doing enough or not working fast enough is a great way to make certain that the volunteer will not help again in the future. Having been a volunteer myself for a good many years, once I became a paid staffer, good volunteer relations became one of my top priorities. After all, much like Christianity teaches us in relations with our neighbors, we should always treat volunteers how we ourselves would like to be treated. But let’s return to the matter of the Ron Paul campaign. Prior to Virginia’s March 6th Republican presidential primary, I spent considerable time and effort in volunteering for the campaign. Regrettably, the Virginia effort was woefully understaffed and under-funded from the national campaign. As I stated, I found both a location and the funding necessary for a regional campaign office in Harrisonburg but was rebuffed by the head honchos in Springfield. Although Ron Paul had not won a single state prior to Virginia, given that only Mitt Romney and he would be on the ballot, my state would be an excellent chance for his first victory. Therefore, the volunteer effort had to continue. Despite the fact that we had no literature, no yard signs, and no bumper stickers, save for the scant few that the state director was under-rationed, we did the best we could to spread the message. I even had the opportunity to promote Dr. Paul on the local evening news. On primary day itself, I’m pleased to say that many of the precincts in both in Harrisonburg and the surrounding Rockingham County had Ron Paul supporters handing out materials that the Shenandoah County Ron Paul group had graciously gifted to us. Although the primary wasn’t all that close either in the state as a whole or in the 6th congressional district, due to the hard work of my fellow volunteers in the area, Ron Paul won a majority of the votes cast on primary day in the city of Harrisonburg. We showed that a small band of dedicated volunteers could make a difference and I am quite grateful to my fellow activists for their work. However, March 6th made me realize that there was absolutely no way that Ron Paul could win the Republican nomination. His national campaign missed an important opportunity to score their first victory on Super Tuesday and the momentum now swung too far in the favor of Mitt Romney. I’ve heard claims that Paul’s national campaign was nothing more than corrupt nepotism, was generally incompetent, or that they were simply too inflexible to modify their strategy. I don’t know what their specific problem was, but, if Virginia is a typical example, clearly the national campaign did not accomplish what they needed to. Nevertheless, if you must place blame, do not thrust it upon the volunteers. I believe that a lot of other local Paul volunteers felt the same way about the campaign as I did and so they disappeared completely. Morale was shattered; we thought the national campaign had abandoned us. How could they ask us to fight on when it was painfully obvious that they were not putting in the needed effort to do so as well? Another I rule I have when it comes to volunteer relations is that you should never ask a volunteer to do a task that you have not, at some point, done your yourself and would be willing to do again should the need arise. Anyway, prior to the March 6th primary, I got in a debate with another volunteer over which was more important, winning the March 6th primary or securing Ron Paul delegates to the national convention in Tampa. I argued that the primary was of far greater value, which is why I focused my efforts there. It makes little difference the personal positions of our delegates if they are bound to vote how the congressional district voted on March 6th on the first national ballot. After all, every single delegate in the state could be a Paul supporter, but if they are pledged to vote for Romney then who they are doesn’t make a hill of beans worth of difference. Bear in mind, if Paul could not win a single state’s primary or caucus, even if he won a considerable number of delegates through clandestine means, then Mitt Romney would be the nominee. Once the primary was over, I focused my volunteer time on other ways that I thought would benefit the liberty movement. Specifically, I spent time helping Karen Kwiatkowski and Jamie Radtke, two women who were still viable candidates in their respective races and encouraged many of my fellow volunteers to do likewise. 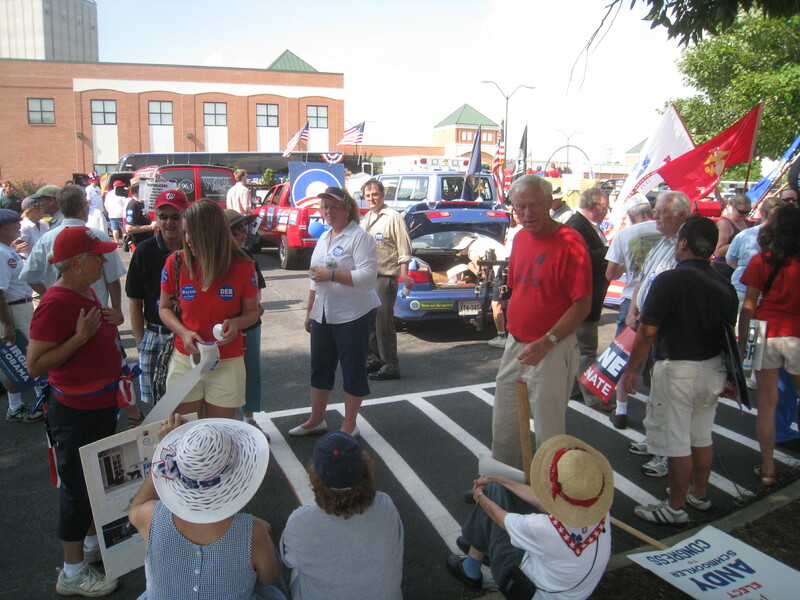 Sure, volunteers could spend a Saturday in Lexington to pick national delegates, but quite a few of us realized that the Republican nomination for president was lost and over and it was time to find new and more productive avenues. But, all of the supposed Paul candidates won at the district convention in Lexington. Therefore, it seems to be particularly strange to quibble about this matter. Didn’t the Paul slate win? If so, why should there be any complaint? It seems foolhardy to lay blame after a victory. Is someone upset that they did not win by a larger margin? One important fact to remember here is that Harrisonburg’s votes did not change the outcome nor could they have. The margins of victory were larger than Harrisonburg’s entire voting strength, even if it had voted as a solid block, could have swayed. After all, we had a scant 39 votes split among the Harrisonburg delegates while some counties like Rockingham County had over a hundred more votes than we did. Many of my fellow Ron Paul delegates signed up in Rockingham, but when taken as a numbers game, Harrisonburg’s delegation wasn’t all that important in the grand scheme of things. Anyone who has spent any time dealing with Paul supporters knows that they are a freethinking lot. Who is to say that Paul supporters would have voted the same way? Although a sample “Paul friendly” ballot was provided, I’ll freely admit that I voted as I thought best and not merely regurgitated what some piece of paper had written on it. So, for those who still condemn me for the fact that only two delegates were open Ron Paul supporters from Harrisonburg, should I similarly scorn Paul activists from Roanoke, Staunton, or Lexington? After all, how did Ron Paul fair in your area on March 6th? And given that Paul outright won both Covington and Lynchburg, does that result give activists from those cities cause to rebuke the rest of us? If so, should we apply the same standard to results of the June 12th primaries? Should we look down upon the efforts of volunteers in other parts of the 6th because Karen Kwiatkowski won Harrisonburg, but not other localities? The answer is no. Here in the Shenandoah Valley, we must not devolve into this kind of infighting. It is detrimental. How do pointing fingers and tearing each other apart advance the cause of liberty? Should we be concerned with inflating our own egos and promoting individuals as opposed to the greater concept of liberty? Heaven forbid! Given the attacks against me, I assume some people must think that I am all talk and no action. But this line of thinking is false. For example, I proudly served the 2008 Ron Paul campaign as the director of grassroots organization for the state of South Carolina. And although I don’t talk about it much, I was briefly hospitalized with internal bleeding as a result of an injury sustained on the campaign trail. Unfortunately, it periodically flares up to the present day. But I continued, for the battle was too important to give up before primary day. I was a volunteer in 2012, I once again helped out Dr. Paul because he and I share a commitment to the Constitution and to liberty. I write of these experiences not to make some boast of my greatness or to make the claim that my devotion is greater than anyone else, but merely to illustrate the point that I have been involved for many years and have a good bit of knowledge and experience in the matter. The main idea of the letter is much more far-reaching than merely who did or did not attend Virginia’s 6th district convention. Heck, it is more than about you, myself, or even Ron Paul. It is a matter of respect for volunteers. Whenever a person, whether he or she happens to be a staff member or a fellow volunteer, berates a volunteer, you should be appalled. Remember that volunteers are the lifeblood of our movement. I assure you that without dedicated volunteers, failure is all but a certainty. An activist or politician working alone can accomplish very little. If you have a complaint about how 2012 primaries turned out, is tearing down your fellow brothers and sisters in liberty who freely volunteered their time a productive way to vent your frustration? Therefore, the next time you hear a person speak ill of a volunteer except in the very limited circumstances listed above, you should stop them from doing so immediately. If they refuse to comply, then have nothing more to do with that person; there is no sense in dealing with people whose words and actions will lead to the destruction of the movement from within. 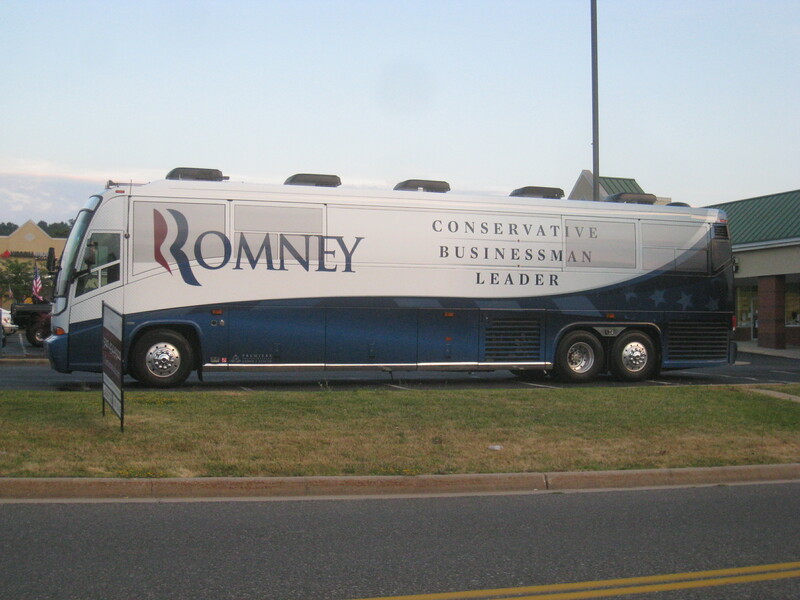 Yesterday evening, Mitt Romney’s “Hope For America” bus pulled into the parking lot of the Republican headquarters on Neff Avenue in Harrisonburg. Although there were rumors that either Mitt Romney or another member of the Romney clan would be on board, they proved to be unfounded. 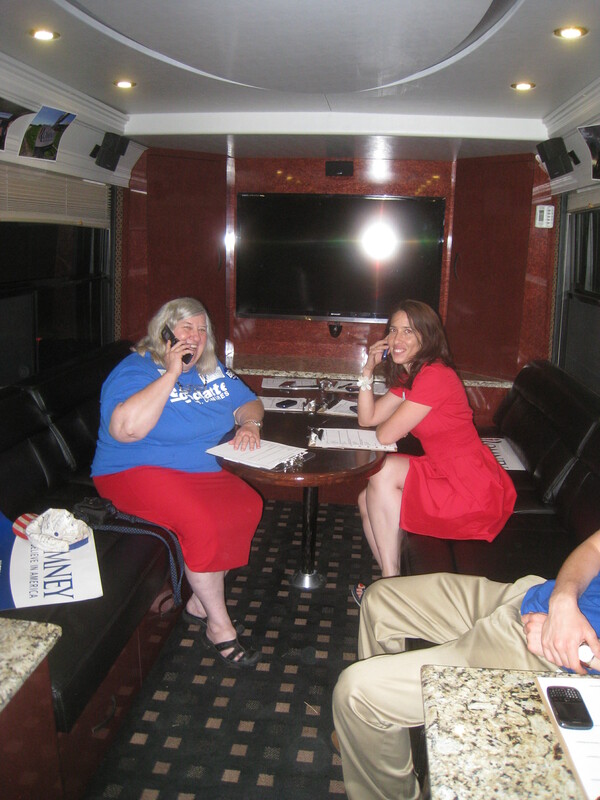 Instead, the bus held quite a few members of Romney’s Virginia campaign team. Despite the lack of the candidate, a throng of enthusiastic Republicans showed up at the victory center including three Virginia state legislators: Delegates Rob Bell, Dickie Bell, and Tony Wilt. 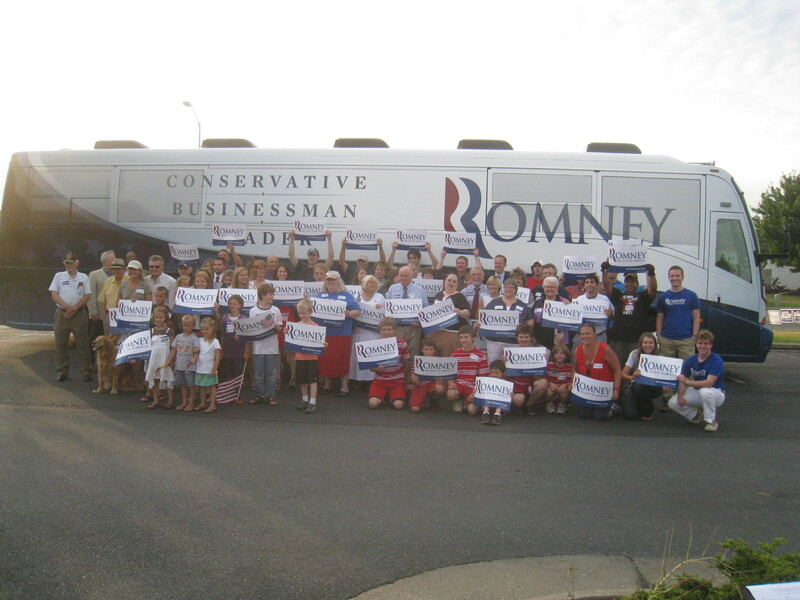 After a short presentation, the Romney campaign invited the crowd to step aboard their vehicle. 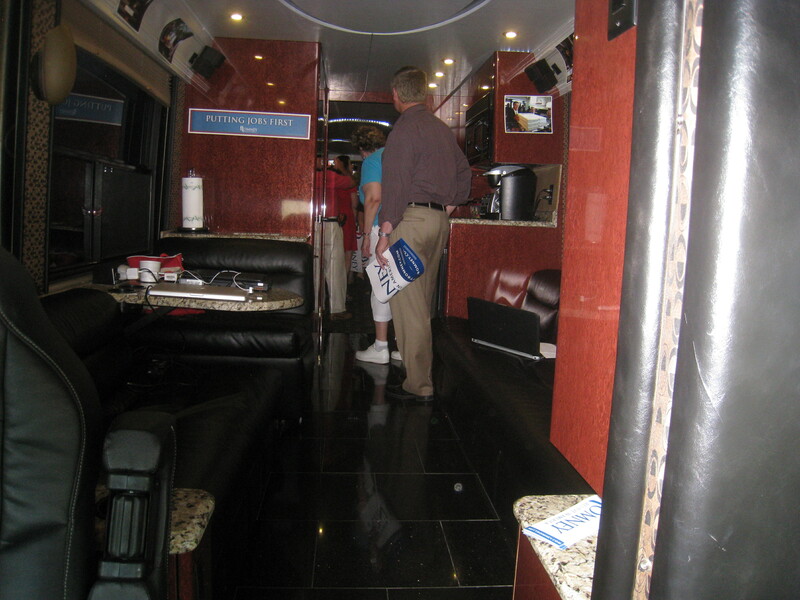 The tour bus seemed to contain every possible feature and amenity. For example, a section of the floors were inlayed with polished stone, there were a handful of televisions, and some of the padded chairs were embroidered with the Romney logo. In less than one hundred and twenty days, voters will go to the polls in November to vote for electors who will choose our next president. During the 2008 election cycle, Barack Obama personally came to Harrisonburg; John McCain sent his relatives. Obama ended up winning the city by about 2,400 votes, a feat no other Democratic presidential candidate has been able to claim in over thirty years. 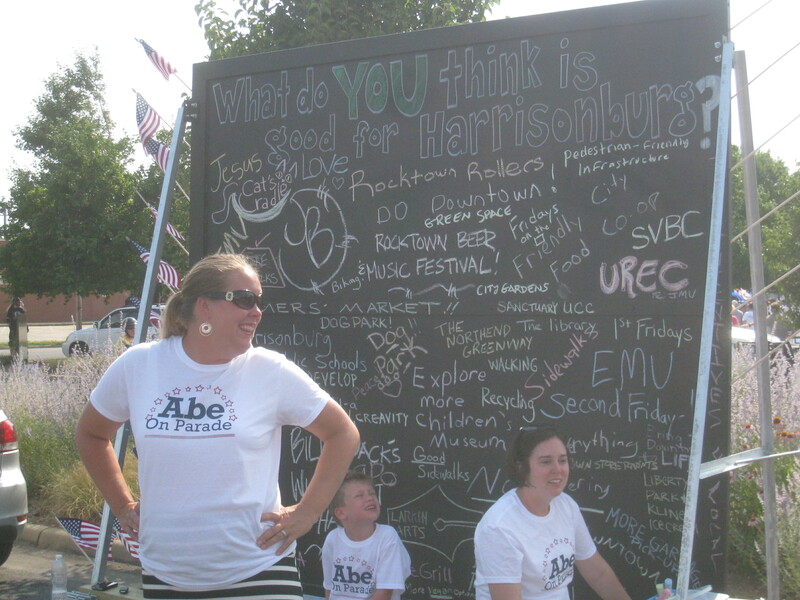 So how much effort will the Romney and Obama campaigns put forth in winning Harrisonburg? And which, if either, of the candidates will make a personal campaign stop in the friendly city? After looking at all of the data, it seems impossible for Mitt Romney to win the presidency if he does not capture Virginia’s 13 electoral votes. Therefore, I would expect that there will be quite a few more visits throughout the Commonwealth from both of the campaigns between now and November. For many Americans, the Fourth of July is a day filled with cookouts and family gatherings capped off by a night filled with a colorful fireworks display. However, given that the date serves as the commemoration for the birth of the nation, it is also steeped in politics. 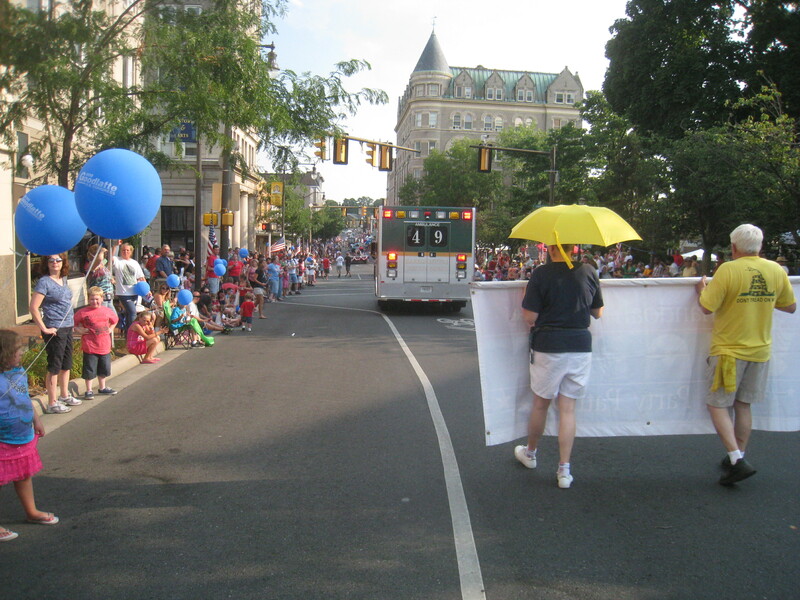 On Wednesday afternoon, the city of Harrisonburg, Virginia held its annual parade to celebrate the day. The weather was quite hot and sunny, a marked difference from last year when a virtual monsoon threatened to cancel the affair. The parade boasted the usual assortment of floats and vehicles: musicians, fire and rescue teams, antique cars, and, of course, political groups. This year, there were four different sets of folks who entered: the Republican Party, the Democratic Party, the Tea Party, and Abe Shearer for City Council. 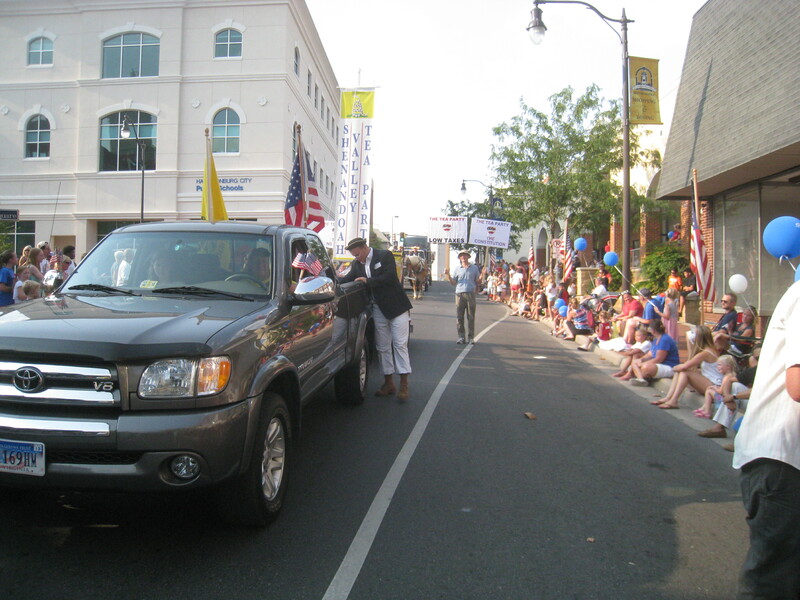 Overall, the candidate who could claim the largest number of visible supporters in the parade had to be Representative Bob Goodlatte (VA-6). There was a veritable sea of matching blue Goodlatte shirts among the Republicans. Other Republican candidates were promoted as well including: Mitt Romney, George Allen, Mark Obenshain, and the various City Council hopefuls. The Democratic Party had an impressive showing as well. They waved signs in favor of Barack Obama, Tim Kaine, Andy Schmookler, and two City Council candidates. I spoke with Deb Fitzgerald, one of the Democratic candidates running, to ask if the Democratic Party only fielded two folks for the three seats up in November. I discovered that although Kai Degner is running for re-election, he apparently had no signs printed to be used in the parade. Running as an independent for City Council, Abe Shearer also made his presence known. Even though some might be tempted to disregard independents, recent elections have shown that they offer beat the two party candidates for this particular office. The outcome for this race will hinge heavily upon the battle between Mitt Romney and Barack Obama at the top of the ticket and the strength of the campaigns of each of the council candidates. 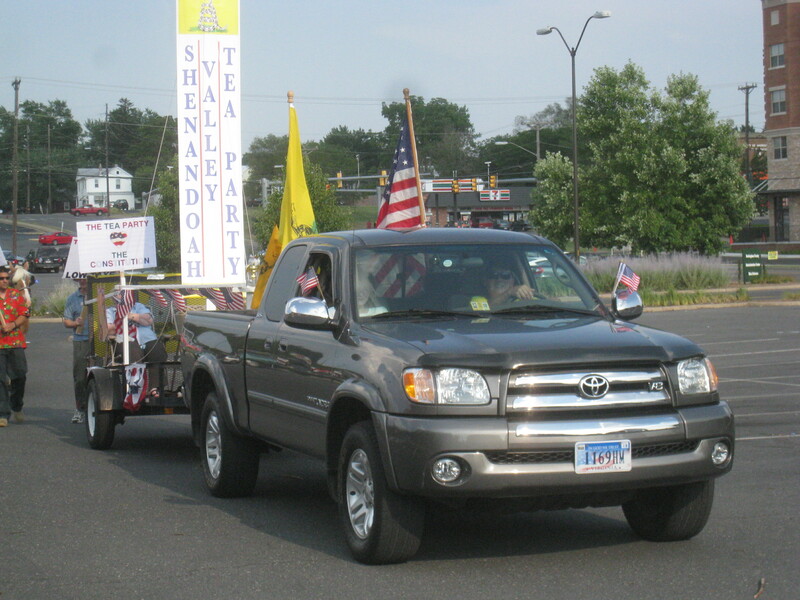 During the trip down Main Street, I walked alongside the Tea Party float handing out copies of the Constitution. In general, the crowd was very receptive and so I ran out of materials a good distance from the end of the route. Given that the Fourth is now five days passed, you might find it odd that it has taken me so long to write about it here. Well, I’m afraid that I didn’t feel much like writing on the evening of the event. On the drive back to the parking lot, I decided to catch a ride on the Tea Party float. As we turned onto a side street, the mast holding the tea party sign struck a low-hanging branch and came loose. Unfortunately, I happened to be in the path of the heavy wooden board as it fell to the ground. Although it was only a glancing blow, the plank did graze the side of my head and collided with my shoulder. At the time, I was worried about the severity of the injury, and, as a result of the pain, did very little for the rest of that evening. However, I’m pleased to say that several days later, only a yellowish bruise and a bit of residual soreness seem to be the only lingering effects. I suppose that one could see a bit of irony in the idea of a person who opposes the idea of government-run health insurance and also does not presently have health insurance due to the tremendous cost involved, becoming injured himself and possibly in need of assistance. Nevertheless, if a person does find him or herself in such a state of need, should one demand that the government redress this problem? Although freely given charity is laudable, the idea of a person compelling his or her neighbors to care for his or her needs through either force or coercion seems to completely reject the basic political tenets of liberty and freedom under which this country was supposedly founded. Anyway, to sum up, except for the surprise accident at the end, I would say that the parade was a rousing success for all of the parties who choose to participate. Speaking specifically of the tea party, I hope that I’ll see a few new faces at our meeting later this month. 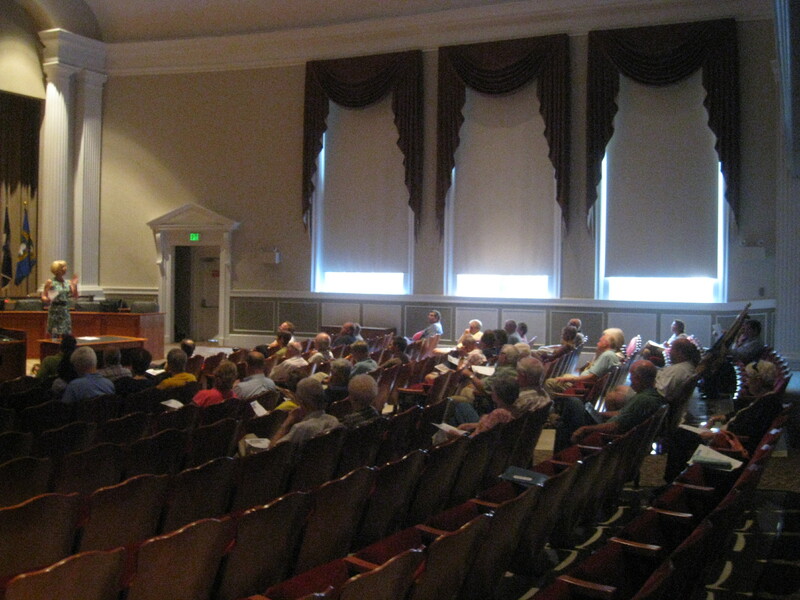 On Thursday night, I attended my first meeting of the Jefferson Area Tea Party. 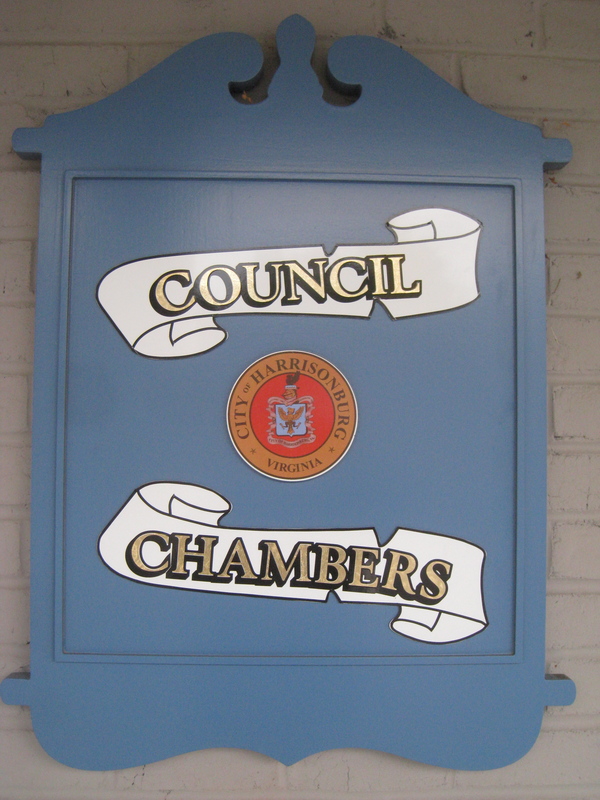 As expected, the membership primarily consists of folks from the city of Charlottesville, where they are based, and the surrounding Albemarle County. The leader of the group noted that there were a considerable number of new faces in the crowd that night. That situation likely stemmed from a general sense of dissatisfaction as a result of the Supreme Court decision earlier that day upholding the constitutionality of Obamacare. Although there were a few topics discussed, outrage over nationalized healthcare and the general belief that the courts failed to defend the law of the land took center stage. After the meeting, the leader spoke to a local TV reporter who was compiling a story on the tea party. 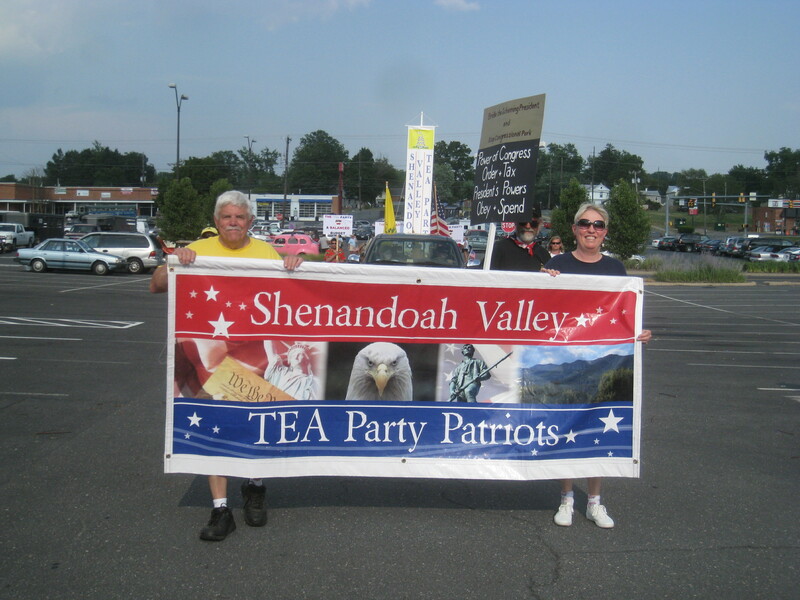 The Charlottesville media was not alone in seeking tea party reaction; an outlet attended the Harrisonburg Tea Party as well. As luck would have it, both that organization and the Staunton Tea Party held their monthly meetings on the same night as Charlottesville’s. So, the real question is will the tea party be able to harness this overall frustration and disgust into tangible political successes? The answer is a definite maybe. As I reported from previous gatherings across the state, Parke West, one of the leaders of We r Virginia, spoke about the effort to train and mold tea party activists into a grassroots army. The purpose of this work is to influence the outcome of the November elections. In response to this call, a vast number of the attendees eagerly signed up to learn more. Regardless of what path you take, if you are concerned about the state of our country and the apparent continued demise of federalism, the 10th amendment, and the idea of a constitutionally limited government, you must take a stand, and you must do so now. It is my hope that the tea parties will lead this movement; if they do, they will continue to grow in strength as they work tirelessly to restore our nation. As I’m sure Thomas Jefferson would tell us, assuming he was still alive, we all know that Obamacare is just one of many federal programs that must be repealed. Isn’t it past time to begin the rollback of the federal government?